Wednesday was a miserable and rainy day. JSL was going stir crazy and kept asking to get out of the house. 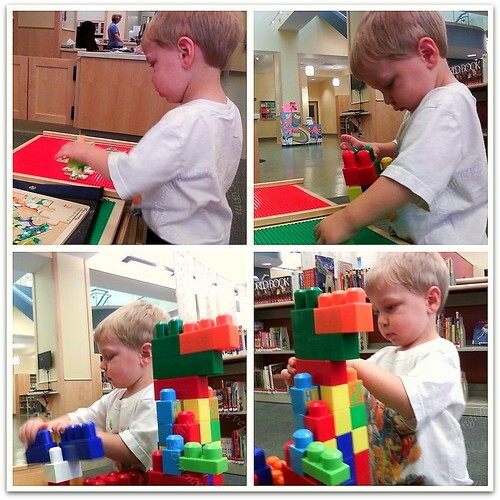 Eventually, I asked him if he wanted to go to the library to get some things and play. Yes, I said play at the library. They were open at that point and I knew they had just gotten some puzzles for kids and had a LEGO table with several types of building blocks. I also thought about taking his library card so he could use their computers to try some things on kid websites. When JSL and I arrived at the library, it was pretty empty. First, we went to get some DVDs and then settled into the kids area. JSL took out a puzzle and then decided he wanted to check out the blocks and build some items. He was playing very nicely all alone. I will spare you the details about what happened when two girls suddenly arrived without any adults. Thankfully, JSL kept playing and was letting the girls take a ton of the items away from him. As JSL was using his imagination, I sat next to him on the floor and was knitting my current small project. It was nice and quiet, so I could knit and watch the little guy play. While there, I also realized that in just a few short days both of the boys will be home for the summer. NHL will be going to camp part of the time, but JSL will be home with me until he starts nursery school part time in the fall. 1. 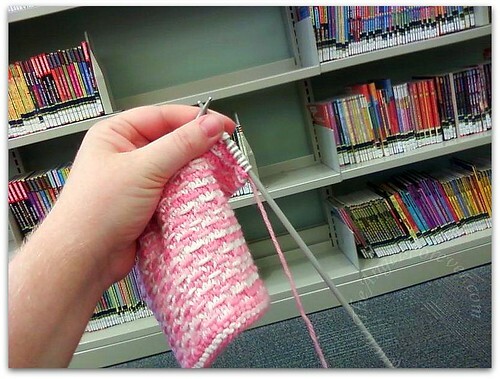 When was the last time you went to the library and what did you do or get while you were there? 2. Aside from spending time at the park, playing outside and visiting the library, what other ideas do you have to keep two kids busy during the summer that will not break my bank? I took my toddler & baby just a few weeks ago. I really had my hands full! We were on a mission to find books about airplanes & machines. Also include U-Pick or free berries that you can find to pick, bike rides and nature walks. .-= Owen’s Mom´s last blog ..Happy National Strawberry Shortcake Day! =-. I went to the library last week. We love going and my kids especially love going. We read there or get read to and they pick out books and movies to take home. I don’t have to worry as yet about summer breaks, but for me, I have no problem with letting my kids be bored. They don’t always need to be doing something. However when it’s my turn with kids, I’d allow them time to play, relax and also still participating in learning so they aren’t behind when they return to school. The reading program at the library is great, summer camp, sending them to hang out with grand parents, volunteering at so many different places for the summer etc. .-= JamericanSpice´s last blog ..Red Hot! 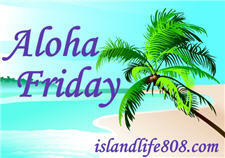 – Aloha Friday =-. OOOH My goodness!!! Guess what! The comment went through and came back to the post! That has never happeend to me before! WOOOOOT! Did you fix something? Oh and i say buy a small swimming pool for the kids! It works magic and is definitely under 20 bucks! Here are some link if you need an idea: waterslide , swimming pool , shark pool, wave rider and boogie boards. I hope it helps! .-= Niky @ Design It Chic´s last blog ..Aloha – Where did i put those darn keys?? ?… =-. Kacie loves going to the library. We haven’t gone in a while but I need to make it back there soon. .-= kailani´s last blog ..Aloha Friday #139 =-. I don’t remember the first time we went to the library, but, my mom always took me as a child and it’s one of my fondest memories. I loved to read and couldn’t wait to go pick out new books each week. As for things to do with the kids, how about family bike rides. Also, around here we have dollar days at the movie theaters where they show kids movies. .-= Kari´s last blog ..Aloha Friday – Favorite Things About Summer =-. i havent been to the library in a long time. But when i go i tend to spend so much time looking because i can never decide on a book. .-= cristiniscouponcrazy´s last blog ..ALOHA FRIDAY!!! =-. oh this is funny i asked a similar question today, we love going to the park too and yesterday we had a super soaker fight outside! .-= Kristen´s last blog ..How do you keep those noggins sharp? =-. We use to go to the movies when my kids were small. I also signed them up for lots of activities. And, we poled it a lot. .-= Harriet´s last blog ..$5 Advertising….Just Another Manic Friday Followers :) =-. need to find where it is since we moved! we just play outside/pool alot!!!! .-= noelle d´s last blog ..Aloha Friday – Sunburn =-. We have been discussing doing a special map of a couple of local malls that takes out all of the stores and lists only the really fun, creative places for kids. We have an outlet mall that has a Bass Pro with a 1000+ fish tank and speed boats you can climb on, but unless you know about it you walk right by. .-= Rach´s last blog ..Aloha Friday #139 =-. I didn’t visited any library since I was in school (long time). But for entertain my girls we make crafts, bake, clean (yes, they help me and love it), and we start our first “summer camp” where we do different activities during the week. .-= Annie´s last blog ..Aloha Friday!!!!!!!!!!!!!!!!!!!! =-. I have been going to the library on a regular basis lately to get books and free DVDs. Do you have a local children’s museum? Maybe going to the mall? As far as keeping the kids busy without breaking the bank – Princess Nagger and I do a lot of ‘backyard adventures’ making up games to play outside when it’s nice, crafty things to make when it’s raining. I’ll also be checking around for local things or discount days at various tourist-type places around that we can go enjoy. .-= Stacy (the Random Cool Chick)´s last blog ..Aloha Friday Follow – Father’s Day Edition =-. Gosh its been forever since I’ve been to the library…with 5 little ones I don’t go much of anywhere alone lol we got a season pass to the zoo which has more than paid for itself! .-= Jess´s last blog ..Aloha Friday – Ice Cream =-. We went a few weeks ago. My two youngest picked out several books and movies. We went to the library a few weeks ago. I read my daughter some books. Besides those things we are planning on going to the beach & zoo. .-= Melanie @ Whimsical Creations´s last blog ..You Capture – Water =-. It was a while back for me.. and it was Movies. My daughter went last week and she got books. .-= Auntie E´s last blog ..AF Question—On the Go Again =-. Do you have a pool you could join? Swimming is always big for us. We are fortunate to have a community pool in our neighborhood. Hm, what else… bubbles, sidewalk chalk, chalk paint… I’m trying to think what else but not coming up wiht much, sorry! Oh, you know about the free movie programs by Regal cinema and one other one (forgetting which) each summer, right? .-= Smellyann´s last blog ..Saturday 9: Jumping Someone Else’s Train =-. Not sure if you got my last comment… it just kind of disappeared! We went a week or so ago. The kids each got 3 books, and I picked up a few more on homeschooling that I have yet to crack open. guess I should get started on that!! Free movies for the summer are always good, getting a summer garden going, sidewalk chalk and chalk paint, bubbles, joining a public pool are some of the things I can think of. I actually just went to the library today. I got a DVD my daughter wanted there. I’m still trying to figure out what we are going to do all summer! I put a box on the sidebar on Albany Kid with summer fun ideas and where to go. So far, the list includes: U-Pick Farms, Indoor Ice Skating, also Hikes. Also, there is a Google Calendar to free events like: concerts, water ski shows, festivals, and much more. Enjoy! .-= Albany Kid´s last blog ..Stalking Bettie and her Marvelous Cupcakes =-.